A few weeks ago I took on the Advocare 24 Day Challenge. If you’ve been reading my blog for long, you know that weight loss is an ongoing struggle for me. It’s actually something I have pretty much struggled with my entire life. During the Advocare 24 Day Challenge, I lost 10 pounds. I lost 2 more the following week. Then, things kind of fell apart. My husband started working REALLY long hours. I basically have not really seen him in 3 weeks. This means I’ve been managing my blog, my full time job, my kids, and all of the household responsibilities alone. I have a HUGE appreciation for single moms and moms whose spouses travel a lot. I don’t know how you do it. It has nearly broken me. I have been absolutely exhausted which means I haven’t wanted to prepare lunches for myself or my kids, I haven’t wanted to prepare meals, and I’m behind on everything else, too. I talked myself into “sticking it out” and here are some tips I came up with as I talked myself into not giving up. 1. Get a Weight Loss Buddy – This is probably the #1 key to success! It’s great to have a buddy to talk you off the ledge when you’re a peanut butter cup (or maybe a tub of ice cream or bag of cookies depending on your “poison”) away from disaster. It’s nice to have someone who is trying to loss weight, too, because they “get” it. It’s even better if they can be your work out buddy, too. The times when I have been most successful with weight loss have been the times when I have had a buddy to stick it out with me. 2. Plan ahead – For me, planning is everything! If I plan my meals (including my snacks) and make sure that I have everything on hand, I’m much more likely to stick with things. If I don’t have snacks on hand and I get hungry, it’s too easy to go to a vending machine and get something that is not healthy. If I don’t plan dinner, when I get home, it’s too easy to decide to go out to eat. I plan my menu for the upcoming week on Saturday and then buy all of my groceries for the week. If there’s “prep” work like cutting up fruits and veggies, I do all of that on Sunday. 5. Invest in a good scale – If you’ve got one of those old school scales with the dial and you’re trying to guess from week to week if you’re on the line or below the line, ditch it and invest in a digital scale so you know exactly where you’re at! I have the Eatsmart Precision Digital Scale and I love it! Don’t torture yourself by weighing in every day, either. DO hold yourself accountable and weigh in once a week, preferably at the same time. 6. Don’t give up – I’m REALLY good at starting diets. I’ve started most of the major diet plans on the market more than once. I lose 5 pounds or 10 pounds and then I give in, usually due to stress, which is a HUGE trigger for me. I end up gaining the 5 or 10 pounds I lost back and sometimes adding more weight to the mix. If you’re struggling with weight loss, I’m sure you’ve heard it one hundred times, but in the interest of being completely cliche, I’ll say it again.. “You didn’t get this way overnight and the weight isn’t going to come off overnight, either.” If you’re at a point where you’re ready to give up, find that buddy who is going to talk you off the ledge and keep going! 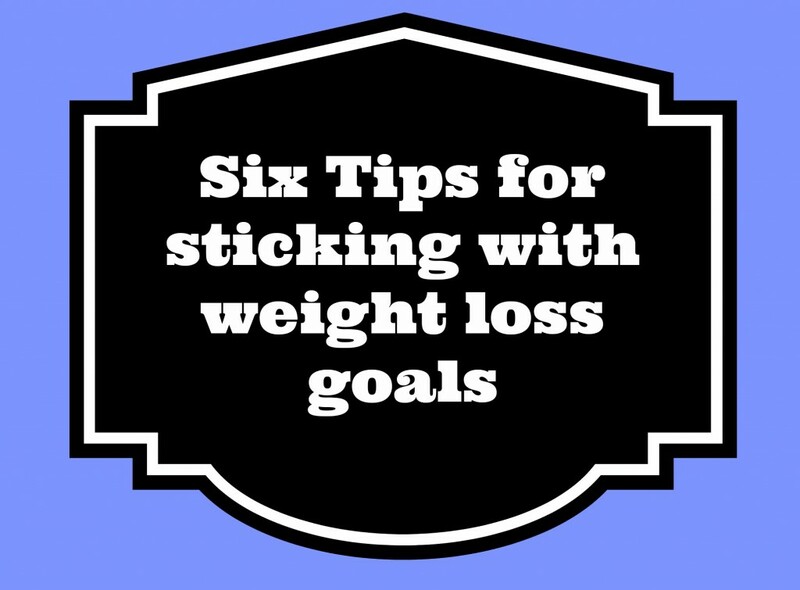 What are YOUR tips for sticking with your weight loss goals? I started the Advocare 24 Day Challenge on September 3rd. The first week was much easier than I thought, even though my birthday, lunches with friends, and a blogging event all fell in there. I wish I could say that the past week had been as easy as that first one, but it was HARD! The good thing is that I learned some valuable lessons!! I attended a conference for 3 days this last week and I failed to plan. I had honestly planned to take my own food and to make sure I had plenty of water, but life got in the way. Consequently, I spent 3 days with not enough water and limited food options (and most of them not on the plan at all). I tried to do the best that I could, but definitely learned the importance of being prepared and planning ahead! I have lost 6 pounds so far. I had honestly hoped and planned to lose more, but I know that 6 pounds lost is better than nothing lost and definitely better than gaining extra weight. That is 6 pounds I don’t plan to “see” ever again. The difference I’m REALLY noticing is in inches. As of last week, I had lost 5 inches total. I’m feeling it in my clothes, too! Last week when I wasn’t able to stick with the plan as closely as I would have liked, I honestly felt awful. Not awful because I hadn’t been able to do what I had planned to do (although that definitely was a factor) but I didn’t have the same energy that I have had, probably because I wasn’t drinking enough water. I have also been really careful about “clean eating” and not eating things with sodium (I have become a HUGE fan of Mrs. Dash products) and I was amazed that I could “taste” the salt in things that I had never noticed before. I’ve got two days of the Challenge left, but it’s not the end of my time with Advocare! I’ll be sharing more about my experiences (and hopefully have more weight loss to report) next week! Were you able to meet your weight loss goals this week? Remember last week when I posted about my dilemma with the scale? I’m happy to report that I’m over that! I am now down 4.8 pounds and I’m starting to feel it in my clothes! I’ve still got a long way to go, but it’s nice to know I’m on my way! My struggle this week is that I got hit with a sinus infection. I had resolved last week that I was going to start exercising more and it just didn’t happen because I’ve been getting home from work and crashing on the couch because I’m so wiped out. My hope is that I will be better and ready to start next week! A lot of things that I thought would be HARD to give up (in particular cheese and chocolate) have not been as hard to give up as I thought. I actually don’t even miss them that much anymore. This weekend will be a true test! Tomorrow I’m heading to a blogging event with a chocolate fountain and cheese from Tillamook Cheese, which is seriously the best cheese ever. I will be at a blogging conference for two full days and meals are included. A big stressor for me has been whether or not I will actually be able to eat what they’re serving. I finally decided to come prepared and just pack my own water, food, and snack so I’m safe! I’ve been loving the Waterlogged app (it’s free) to help me track my water intake and the free My Fitness Pal app! If you are trying to lose weight, regardless of what “plan” you’re trying, I totally recommend both of these apps! They’re free and awesome! 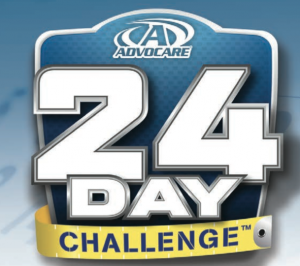 I posted last week about starting the Advocare 24 Day Challenge. I was SOO good about eating last week. On the second day of the challenge, I went to one of my favorite Mexican restaurants for lunch with friends and skipped chips and salsa (which was seriously HARD). I had salad with no cheese, sour cream, or guacamole and just grilled chicken and some salsa. I gave up Sprinkles cupcakes. I didn’t even cheat on my birthday. 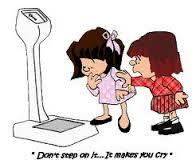 I was SOO excited to weigh in. I was hoping for a 2 pound weight loss, but truth be told, I was hoping for something even bigger and better. I stepped on the scale and…nothing? I was EXACTLY where I had been a week before. Surely something had to be wrong. I stepped off and stepped back on again. It was a half pound less. I stepped on and off again. Still at a half pound. I was shocked and frustrated. I have eaten better in the past week than I have eaten in a LONG time and possibly ever! I have NO idea what happened or why I didn’t lose weight, but I know that I’m not going to give up. Energy levels – I have more energy that I have had in a long time! I used to crash around 2 in the afternoons, which usually resulted in me grabbing a Diet Coke (sometimes my second one for the day) or a not so healthy snack or sometimes both. I would get home in the evenings and experience a second crash. I’m not having those issues now and I’m actually sleeping better at night to. One thing that I will be doing differently this week is adding exercise. I had hoped to add in some exercise last week, but it was one of those weeks where we had something every night and I was wishing for a clone. Hopefully this week will be better. Last week I posted about a free iPhone app to help you track water intake! I LOVE that and it really does help me stay on track! This week I downloaded the free My Fitness Pal app! It’s going to help me track my daily calories and my exercise! Weight Loss Wednesday: My first day with the Advocare Program! It may seem silly that I’m typing this since I have only been on the Advocare 24 Day Challenge for one day, but for me it’s a matter of accountability. I have tried to do these posts before and to post about my weight loss experiences and I have always fickled out after a few weeks. This time I WANT to make things work and I know that part of that is going to come through having a plan for accountability! Some REAL challenges will come today because I’m going out to lunch with some friends at a favorite Mexican restaurant (and I seriously LOVE Mexican food and I love chips and salsa even MORE) and I’m going to a blogger networking meeting tonight with Chick Fil A and SPRINKLES CUPCAKES! Can you say SERIOUS temptation? I’ll keep you posted on how that goes! One of the things you do with the Advocare 24 Day Challenge is drink LOTS AND LOTS of water. I love water, but sometimes I get home and find that I haven’t had anything to drink all day! I have trouble remembering to fit it into my day! So, yesterday I had a PLAN (I’ve decided the key to success with this is plan, plan, plan!) I drank a bottle of water in the morning when I got up. I drank another bottle of water on the way to work, and I took several bottles of water with me to work. I know it sounds crazy, but I actually set an alarm on my phone to remind me to drink water throughout the day! 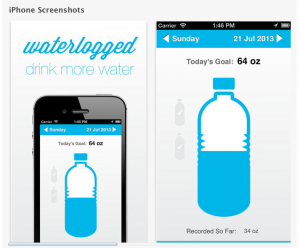 I haven’t tried this yet, but I discovered a free iPhone app to help you track water intake! I just downloaded it this morning! The biggest challenge for me? CANDY! I don’t even really love candy to be honest, but if you’ve ever worked in a school, especially an elementary school, then you know that treats are kind of everywhere. In the past, when I would pass my assistant principal’s office or head into the workroom, I wouldn’t think twice about grabbing a piece every now and then. Every time I walked through those areas yesterday, I had to remind myself to step away from the candy! No cheese – During the cleanse phase especially, you are supposed to limit dairy. I anticipated that this would be VERY hard because honestly, I LOVE CHEESE! I had a wrap yesterday and I thought I would hate not having cheese or mayo or ranch dressing, but guess what? I added avocado and spinach and tomatoes and it was actually REALLY yummy! Energy – I get up REALLY early in the mornings (think 3 a.m.) and my sleeping habits aren’t the greatest. I have no problem falling asleep at night, but staying asleep is a different story. I am a Diet Coke addict, and have to have a Diet Coke every afternoon to help me survive. Even with that, I find myself struggling to stay awake in the afternoons and usually find myself crashing once I get home. I was surprised at how much energy I still had left when I got home from work yesterday! Being HUNGRY – I was really worried about being hungry because, let’s face it, I was used to basically eating whatever I wanted whenever I wanted and I was doing a complete 180 and going to basically lean meats, fruits, and veggies. Surprisingly, I didn’t have to worry about this. I think that planning ahead and making sure that I had meals and snacks ready helped a lot. Sometimes, I will go for long stretches at work without eating and then I will be starving and binge. Or, I get home in the afternoons and I’m so tired that I start snacking to try to compensate. Day 1 I really didn’t feel hungry. I’m guessing it’s all that water?? Next Tuesday will be my first time weighing myself. Hopefully I’ll have some great results to share! I also plan to share a giveaway to keep you motivated and help you achieve your weight loss goals! What are your weight goals? What are you doing to stick to them?